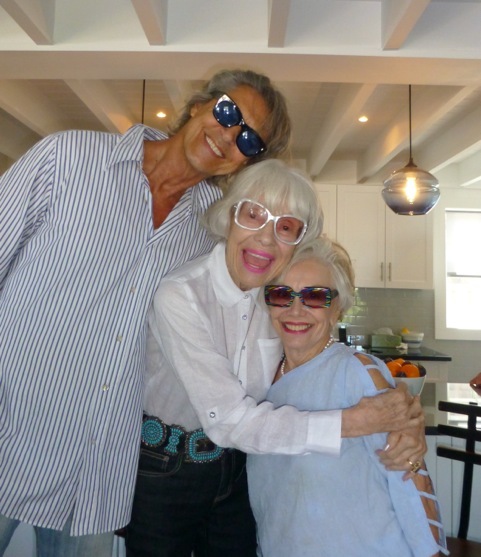 The devotion to the legendary Carol Channing was evident throughout our recent trip to New York and Fire Island. The show that Carol had been signed to do at the Ice Palace in Cherry Grove, Fire Island, was sold out months before her appearance. The entire resort seemed to be present when the ferry landed at the Cherry Grove dock. Hundreds of people poured onto the dock with cameras and smart phones to photograph the legendary entertainer. They represented every age. As we started to leave for the home where we would all stay, they started singing – first a few and then everyone, “Hello Dolly, Hello Dolly….It’s so nice to have you back where you belong…….” It was a touching moment for all of us as well as for the lady to whom they were singing. And if you don’t know, it was Carol who originated the role of Dolly Levi on Broadway in 1964. Despite the film that starred Barbra Streisand, it is Carol Channing who will always be identified as the true Dolly. And in the theatre’s best “the show must go on” tradition, Carol performed the starring role in “Hello Dolly!” on stage more than 5,000 times. The adoration continued when we arrived at Sam Green and Chris Lacovara’s exquisite home overlooking the bay and the ocean. Carol’s good friends, the handsome, tall and slender Tommy Tune, his friend and assistant Peter Glebo, and manager Wayne Gmitter, were at the house waiting for us and there were hugs all around when she arrived and excitement about the following night’s show. Tommy, I learned, had met Carol when he was 17, long before he became a theatre legend with nine Tony Awards. Carol calls the performer, director and choreographer (yes, all of that) her “spiritual son” while she is his “spiritual mother” and you could see the mutual admiration in their eyes. Sam Green was so thrilled to have Carol as a guest that he personally made the dill sauce to go with the salmon we had for supper. “I am absolutely thrilled to have Carol Channing as a guest!” he repeated several times. Carol had been to Fire Island before – to visit composer-lyricist Jerry Herman who wrote the score for Hello Dolly! (as well as Mame and La Cage Aux Folles). “I still believe that,” said Carol. A tall blonde in a striking dress and high heels suddenly appeared. “Hello, I am Justin Vivien Bond,” she said in a deep voice (a lot deeper than Carol’s). “I am happy to meet you.” Justin Vivien, it turned out, was going to interview Carol on stage the following night. Bond spoke to all of us but was focused on Carol. Everything and everyone was focused on Carol. Two blow ups of the invitation to the cocktail party two nights later at Tommy Tune’s Manhattan penthouse honoring Carol covered the top of the refrigerator. The clever invite read “Cocktail Party” in bold black ink. Eyes and huge black eye glass frames with bright red lips were seen underneath. You knew it was for Carol. Tommy, Peter, and Wayne were excited, not only about the show but the party at Tommy’s Manhattan penthouse two nights later. Peter turned to Carol, “So many of your old friends will be there,” he said. More to follow – so log on! !